Photo: Sofia Blaney, centre, practices a traditional dance with Gail Blaney, right. Members of at least five Northern Coast Salish communities came together for a group jam session in preparation for the summer canoe journeys. 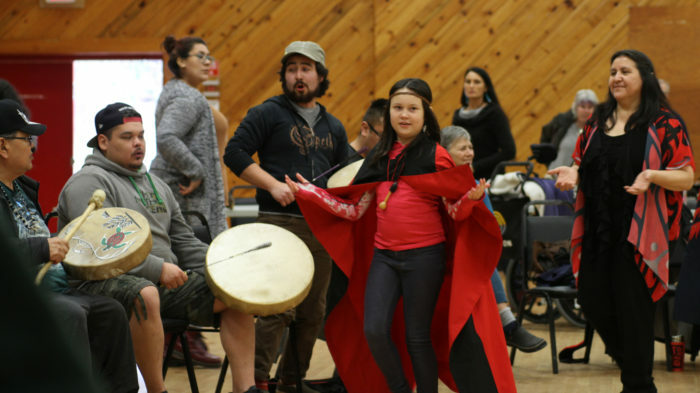 Traditional songs were practiced during a biweekly Northern Salish Coastal Jam event at the Tla’amin gym on Feb. 23. Members from the Tla’amin, Homalco, Klahoose, Qualicum and Sechelt nations attended the event which included drumming, ceremony and dancing. During the event, Homalco carver Sherman Pallen unveiled a raven mask that he spent about four years working on. The mask was danced for the first time by Kyle Francis of Tla’amin. “I wanted it to be perfect,” Pallen said. Homalco Elder Rita Pimlott was also honoured during the day for donating a collection of about 16 baskets back to Tla’amin. The baskets date back many decades and were woven by Annie (Pielle) Chapman and Jeannie Dominic. Dominic was laid to rest in Tla’amin, which is why Pimlott wanted the baskets to go back to that territory. The baskets are now on display at the Powell River Museum and will eventually go on display at Tla’amin. Tla’amin cultural manager and event organizer Drew Blaney said he was thrilled to see many communities coming together to practice their culture and to lift each other up. “I’ve been looking forward to this day for a really long time,” he said.